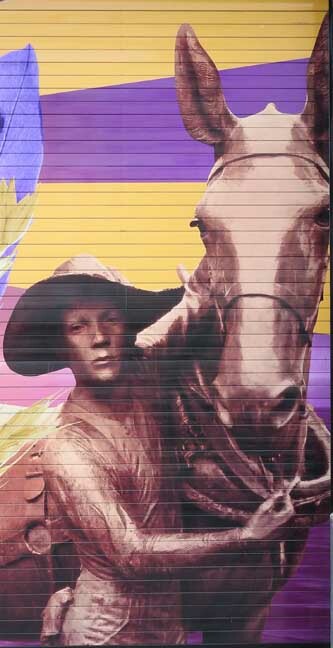 Buffalo developer Benjamin Rathbun erected the Webster Block on the east side of Main Street at the southern end of the Downtown survey area in 1835, among his numerous construction projects in the city. 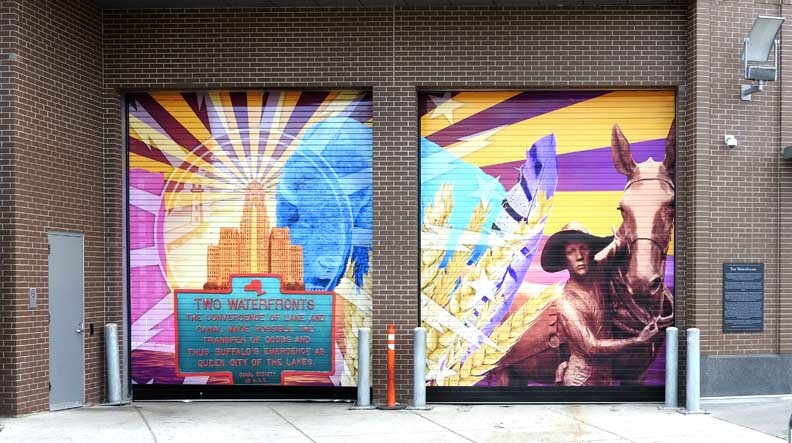 During the period 1835-1836, Rathbun erected 99 buildings, including 52 stores, 32 dwellings and a theater. 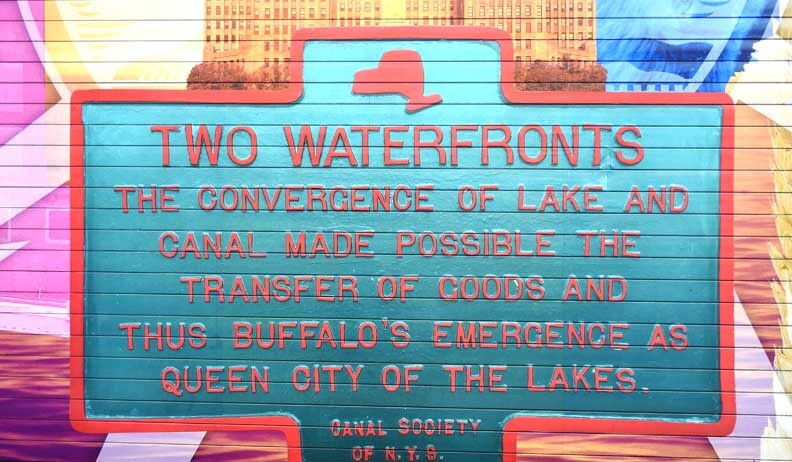 Constructed for Joy & Webster, the Webster Block of four-story brick buildings comprised seventeen stores, wholesale and retail houses dealing in groceries, dry goods, and other commodities. In addition to the stores, moderately priced hotels for immigrants and sailors were constructed in the area and included Huff’s Hotel and Traveler’s Home at the corner of Main and Scott streets. 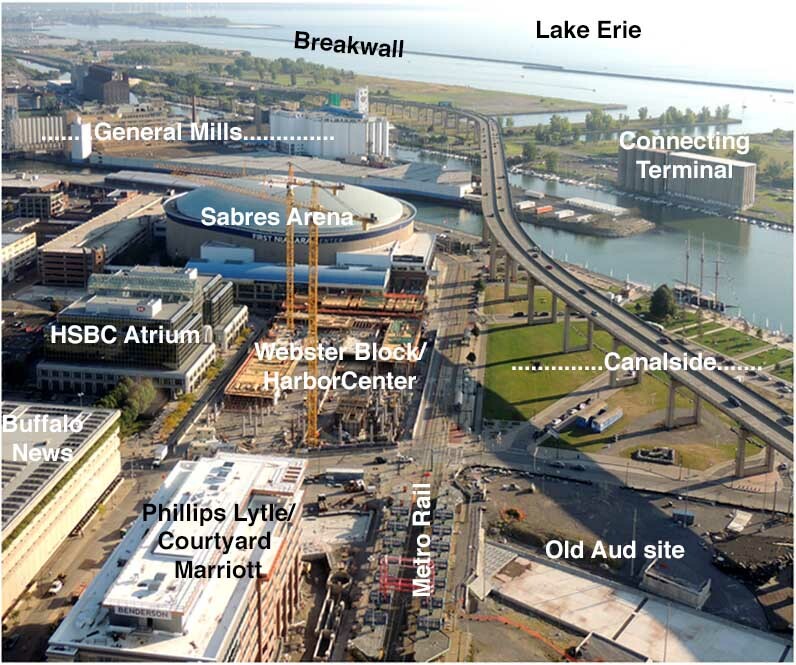 HarborCenter is a hockey-themed mixed-use development in Buffalo, New York. 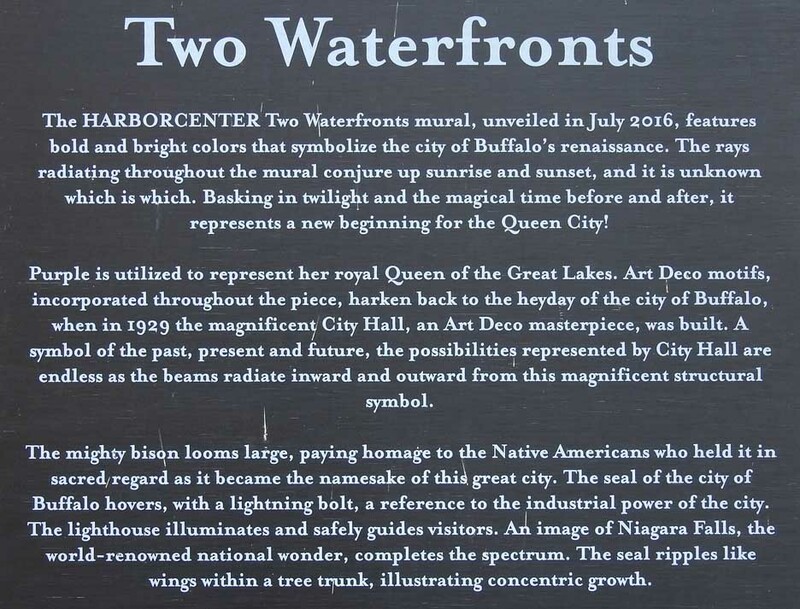 The building occupies a full 1.7 acre city block formerly known as the Webster Block, directly across from and connected to the First Niagara Center and the Erie Canal Harbor or "Canal Side". 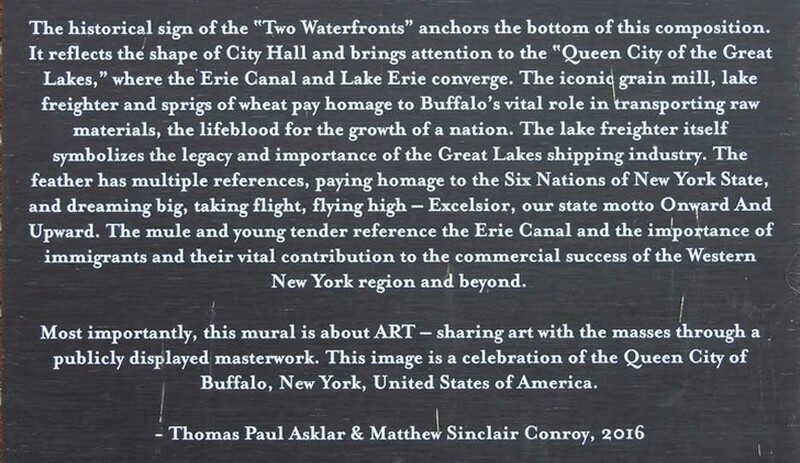 The building is also located near the southern terminus of the Erie Canal Harbor (Metro Rail) station. 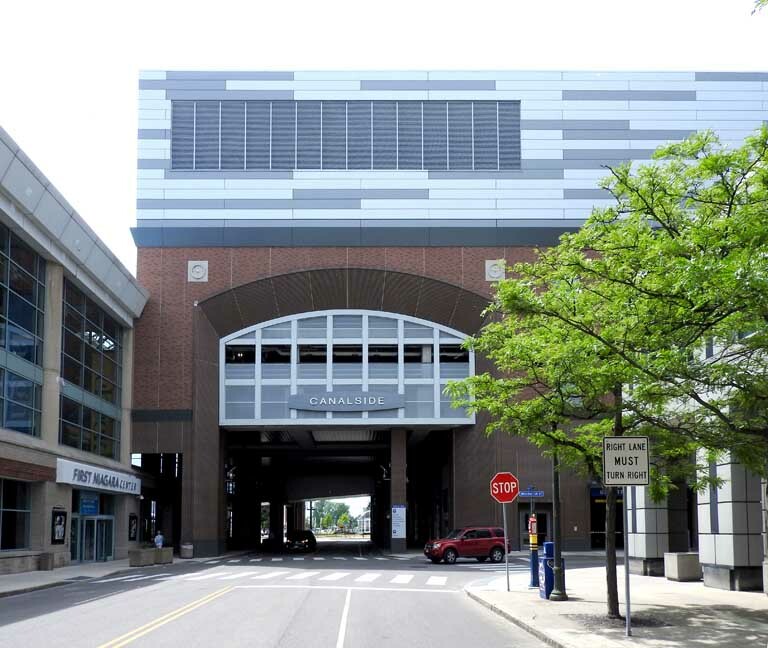 Construction of the 20-story HarborCenter began in March 2013, the same month the Webster Block was purchased from the City of Buffalo for $2.2 million. 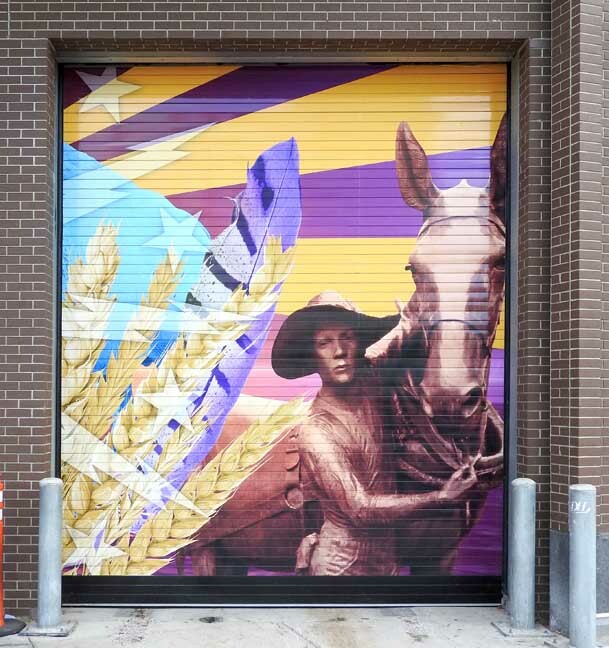 The building was built by Mortenson Construction with ICON Venue Group serving as the project manager. 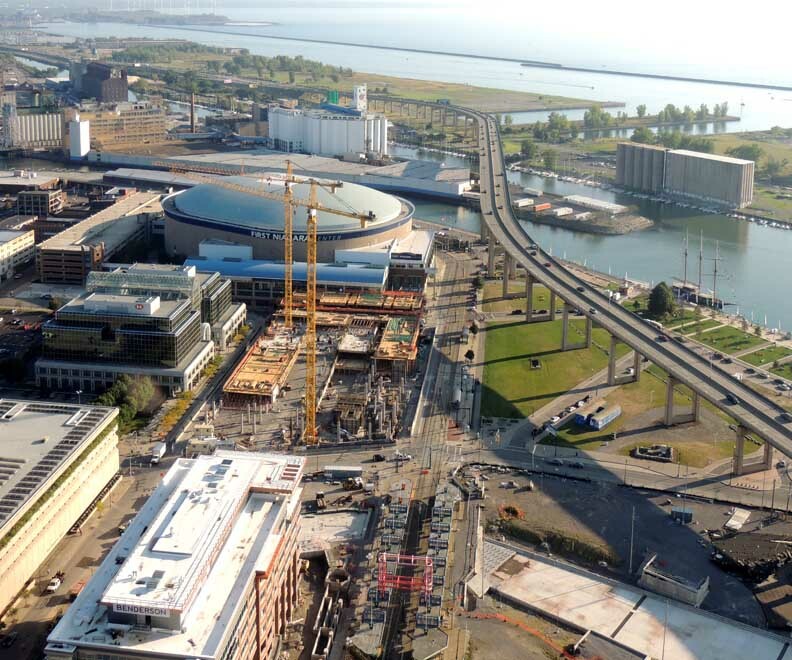 The building's hockey rink portion topped out on June 25, 2014, as the last structural beam for the hotel was put into place. Building construction was completed on the whole building in August 2015. 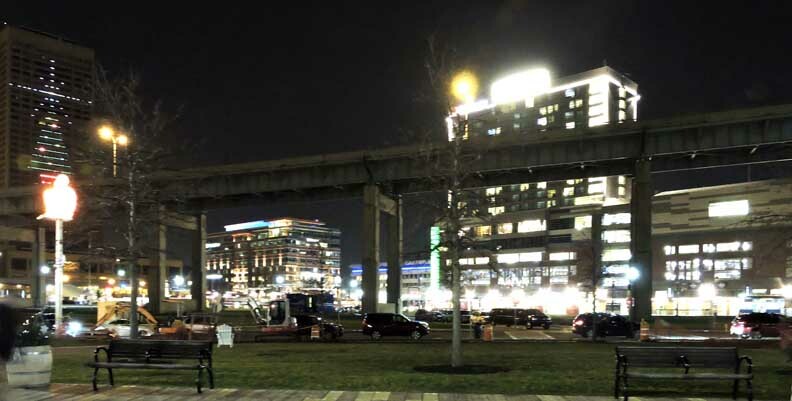 The rinks and restaurants opened on October 31 and November 6, 2014. 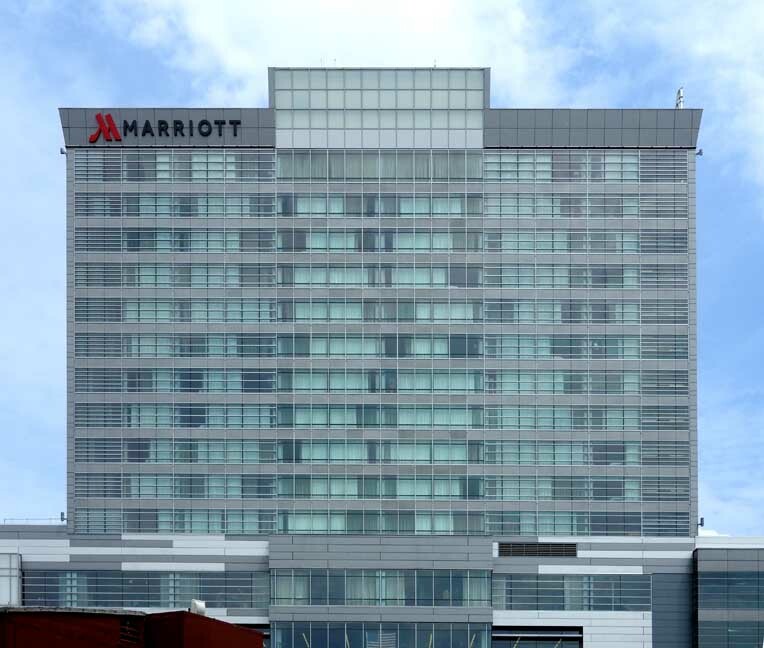 The hotel opened on August 27, 2015. 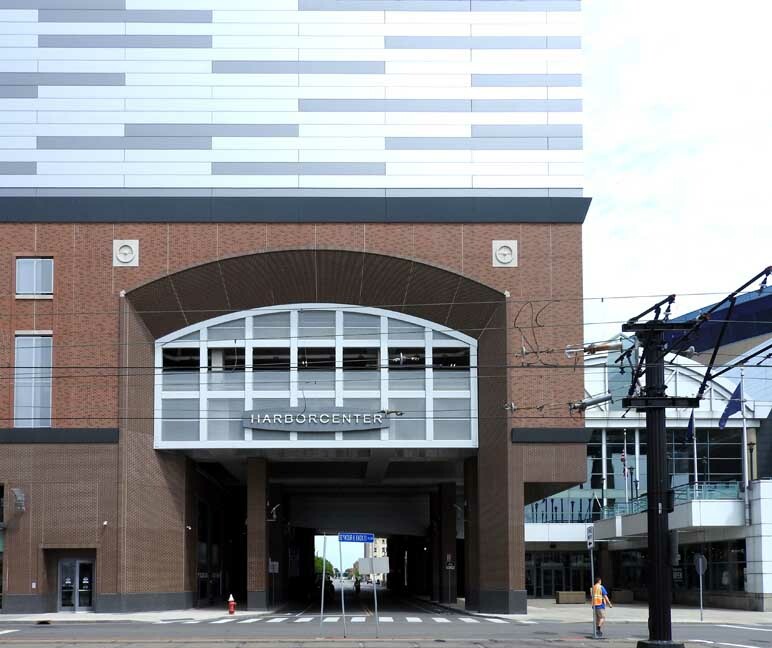 HARBORCENTER was financed by Buffalo Sabres owner Terry Pegula. 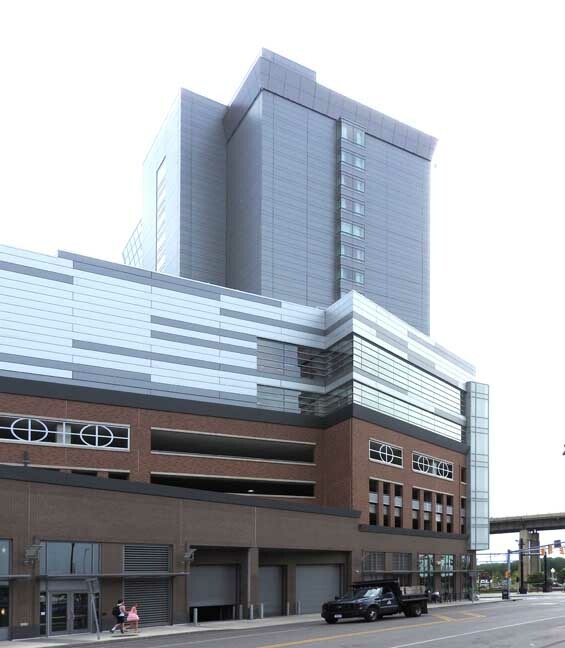 The building contains indoor parking for 750 vehicles, and features two NHL regulation indoor ice rinks on the building's sixth floor, one with an 1,800-seat capacity and the other with a 150-seat capacity. 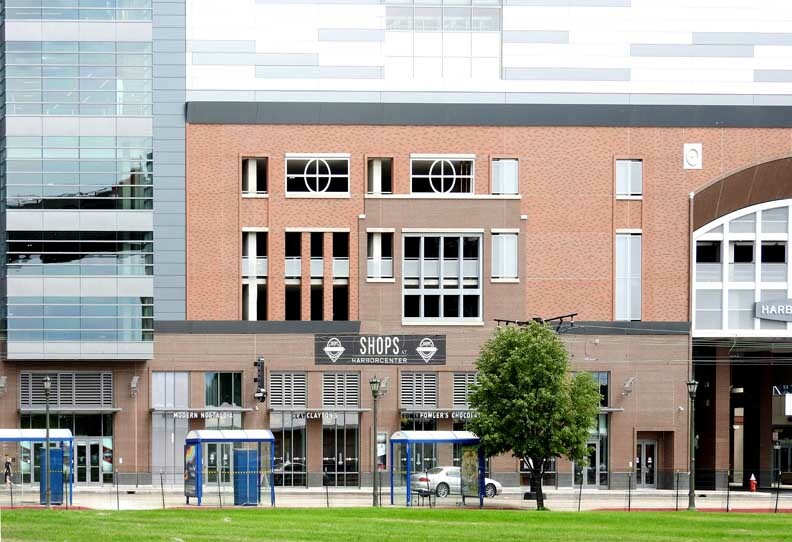 IMPACT Sports Performance owned by the Pegulas operates HARBORCENTER’s 5,000 square foot, high performance off-ice training facility located on the building's 6th floor. The building also contains a classroom and RapidShot Hockey Training System. 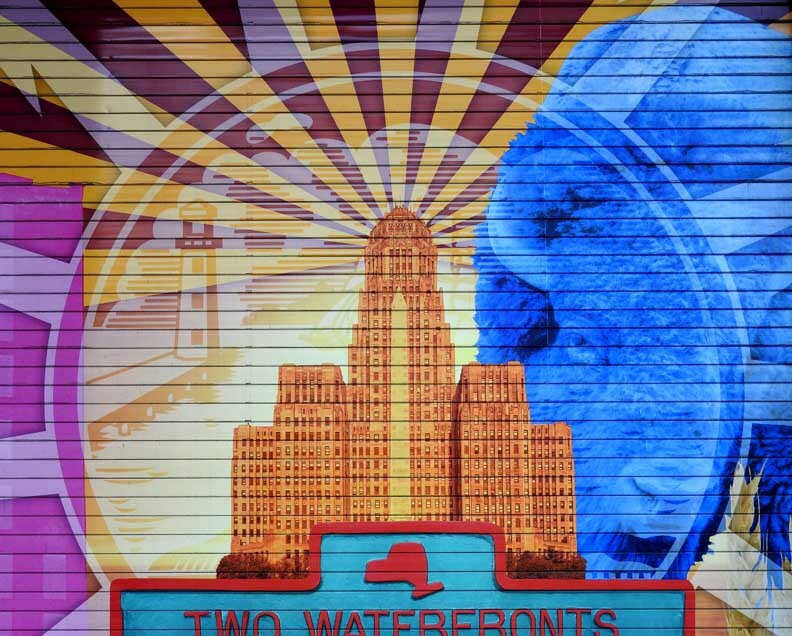 The development is one of the most expensive for any privately funded single building in the city of Buffalo history. 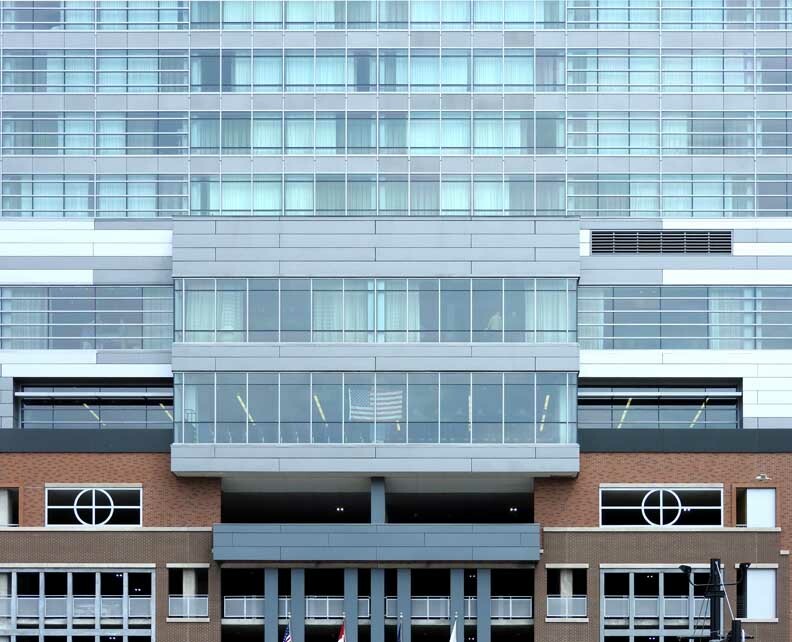 The project is designed to achieve LEED certification, with a goal of LEED Silver. 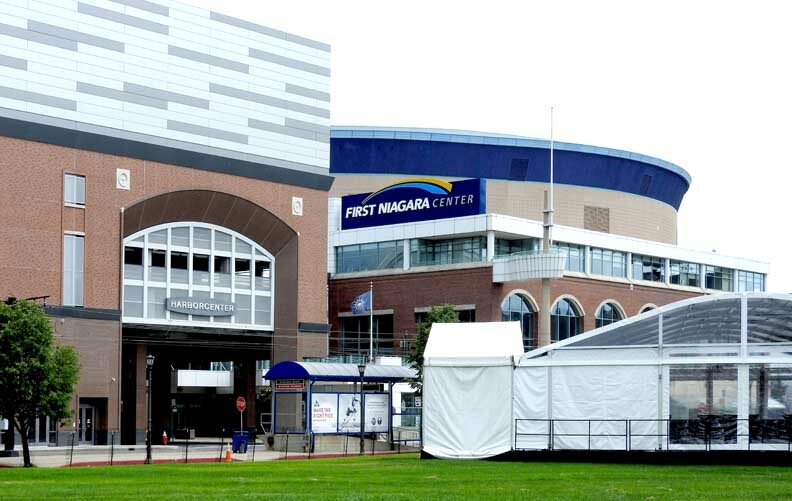 The building was pledged by Pegula and others involved upon obtaining the property to open at the time by September 2014 making it one of the faster projects in the area. 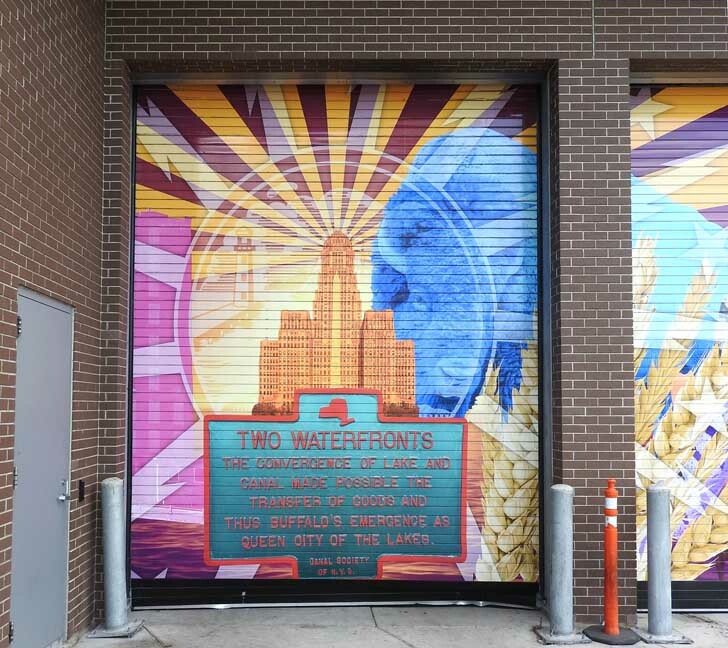 The building contains a 205-room fully serviced Buffalo Marriott HARBORCENTER hotel operated by Shaner Hotels, plus retail and restaurant space. 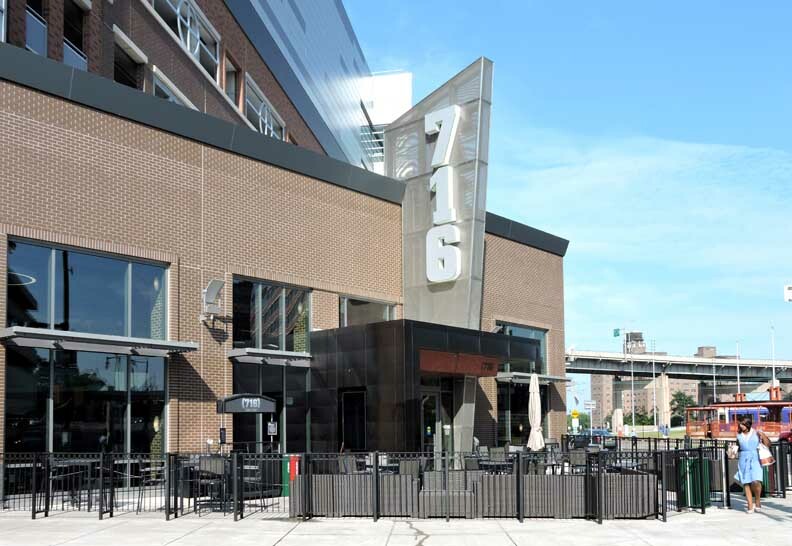 A two floor 716 Food and Sport restaurant, built in design much like Real Sports Bar and Grill in Maple Leaf Square in Toronto opened on October 31, 2014. 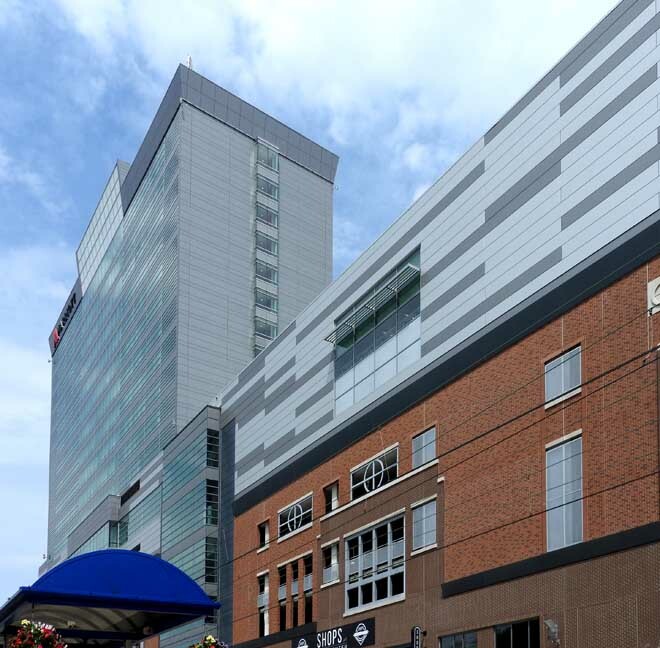 Also, HarborCenter features a flagship Tim Hortons that pays tribute to Tim Horton, the Buffalo Sabres, and the former Buffalo Memorial Auditorium. The restaurant opened on October 30, 2014. A Statue of Tim Horton was dedicated across the street the same day. The building also contains a pro shop.